Kicking Horse Mountain Resort is one of Western Canada's premier mountain resorts offering world-class skiing and snowboarding in winter and amazing sightseeing, hiking and mountain biking in summer. Home to the highest elevated restaurant in Canada - the Eagles Eye Restaurant - Kicking Horse is a hub of activity surrounded by vast Canadian mountains and a world of outdoor adventure. Take the chair lift to mid-mountain and explore the alpine terrain, visit the Grizzly Bear Interpretive Centre or marvel at the mountain bikers descending the nearby single-track. For those who need a little more adventure, ride the gondola up to 7700 feet and take in breathtaking scenery of the Columbia River Basin. 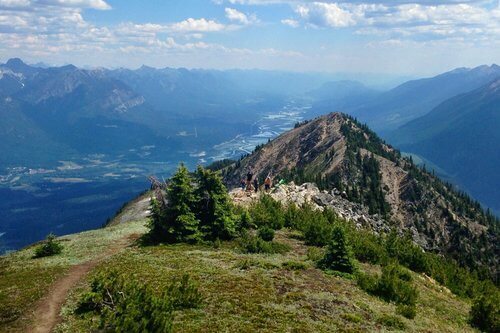 The peak of Kicking Horse Mountain feels like the top of the world. For sightseeing tickets and passes, visit kickinghorseresort.com. Kicking Horse Mountain Resort's newest summer attraction is the "iron road" fixed route climb along a series of cables, ladders and bridges on the mountain's Terminator Ridge. With two routes to choose from - varying in length from 2 to 4 hours - there's something for everyone. And since you're clipped in the whole way, even novice climbers can give it a try. For details and to reserve a space, visit kickinghorseresort.com. Ride the gondola to the mountaintop where a variety of hiking trails meander along breathtaking ridge lines. From the 20-30 minute CPR Ridge Walk to the more difficult 2-3 hour Terminator Ridge hike, and the 10km easy descent from the top of the mountain to the bottom, the terrain and views will inspire you with their rugged beauty. Ride through a series of challenging trails at Kicking Horse Resort's lift-accessible mountain bike park. With 3700 vertical feet to explore, there is something for every experienced rider including the 10km "It's a Ten" road from the top off the mountain to the bottom to berms, jumps, wooden features, rock slabs and singletrack. If you want to make the most of your biking visit, Kicking Horse Resort offers mountain bike lessons and clinics for a variety of skill levels. Located within the Kicking Horse Mountain Resort area, the Guest Information & Tour Centre can be accessed by taking the Catamount Chair Lift up to the mid-station. Boo was an orphaned Grizzly Bear that now lives in the world's largest, enclosed, protected Grizzly Bear habitat. Multiple times a day, one-of-a-kind interpretive tours are offered where visitors can view a grizzly bear interacting much as they do in the wild; foraging, hunting, playing, swimming, snoozing and exploring. Tours run regularly during the spring and summer months. properties to suit every taste and budget.